A locker for your boards, outdoor showers, a museum of sustainable surfboards in the halls, and an Andy Davis mural with three Danny Hess guns to greet you every day as you walk to class… Where was this when I was a freshman?! With most college students starting their fall semesters right now, we thought we would introduce quite possibly the coolest dorm in the world—Zura Hall at San Diego State University (SDSU). When SDSU started to renovate Zura, the Student Housing department and their contracted architecture firms, Mahlum and HMC, decided to embrace the surfing culture that is synonymous with San Diego and integrate that into the interior design and student experience. As an SDSU alum who lived in the brick dorms next to Zura Hall my freshman year, I could understand why the team wanted to prevent students like me from clogging the drains with sand and leaving their surfboards and wetsuits to dry in the shared bathrooms… Student Housing saw a way to remedy this while getting the kids stoked on surfing (especially out-of-state students). Their team, who was seeking LEED certification for sustainable design and construction, quickly learned how toxic traditional PU surfboards are, which would be a problem for the indoor air quality requirements for LEED (and the fire marshall). Seeking more environmentally friendly surfboards, they contacted Dr. Jess Ponting at the Center for Surf Research on campus who looped myself and STOKE into the project to get as many shapers on board who were progressing sustainable surfboard design. Chad Kaimanu Jackson in his shaping bay with a custom hemp surfboard (5’8″ Freekazoid). While the shapers grinded away, we helped the Zura team design the surfboard lockers so they could accommodate longboards as well as shortboards since we would expect the whole gamut of experience levels and quivers. Each locker can fit at least 2 boards (up to 11’), wetsuits, wax, extra fins and leashes while ventilation and drainage underneath keeps things from getting funky. Near the end of the project, we had a unique engineering dilemma. How could we mount the boards at the end of each hallway so that frothing freshman couldn’t rip them off the walls, but preserve the integrity of the boards so they could still be rideable someday? Thanks to Hess’ input on the design, the boards can be dismounted with removable brackets and then you can patch where needed, add fins, wax, and then they’re ready for the water. Not typically found in a construction trailer... Prototype #1. The cherry on top was when the architects came to us asking for a mural. I knew exactly who my first pick would be—a San Diego local and iconic surf artist, Andy Davis. Besides seeing Andy in a hard hat and flip flops on a construction site, the highlight was the finished mural of course—20’ x 8’ of pure stoke. Once Zura opened up its doors to incoming freshman, the Student Housing department took it one step further and asked Dr. Jess Ponting if he would be interested in creating a special surfing and sustainability course for students in a Residential Learning Community (RLC). Thus, Adventures in Surfing and Sustainability was born! 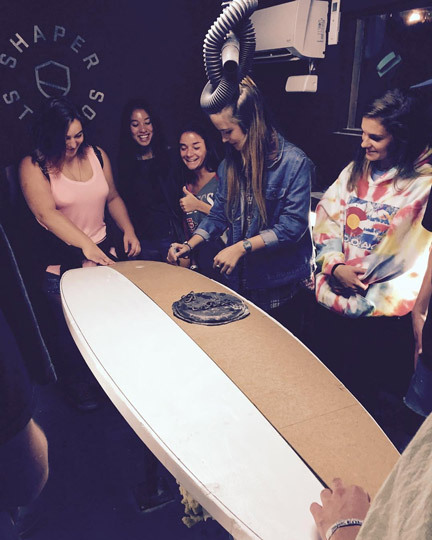 The students learn about the surfing industry, sustainability, sustainable surf tourism, how to surf, and how to shape a board with Shaper Studios! Congrats to SDSU and the Zura renovation team for achieving LEED Silver! We hope more coastal universities take a page out of SDSU’s book! Not only for surf culture, but also the gender-neutral bathrooms on every floor, the environmentally friendly building materials, carbon neutral pledge, and an outdoor deck with BBQs, fire pits, ping pong tables, a rooftop garden, and projector screens… How old is too old to be in the dorms again?